Cross site scripting or XSS is one of the top vulnerabilities of the internet. In many ways, it is easy to test for. Actually taking advantage of the vulnerability takes a little more creativity, but it is done every day, and can lead to a full compromise of both your own servers as well as those of your clients. 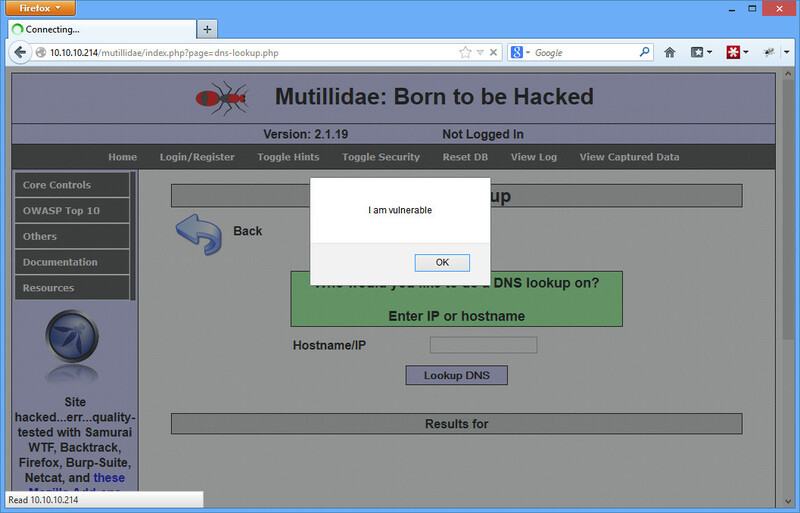 Mutillidae has some great XSS examples. There have already been postings on how to get it setup and get started using Metasploitable 2. I’ll be using the /mutillidae/index.php?page=dns-lookup.php page. The classic way is to simply add an alert tag, such as <script>alert(‘I am vulnerable’);</script>. 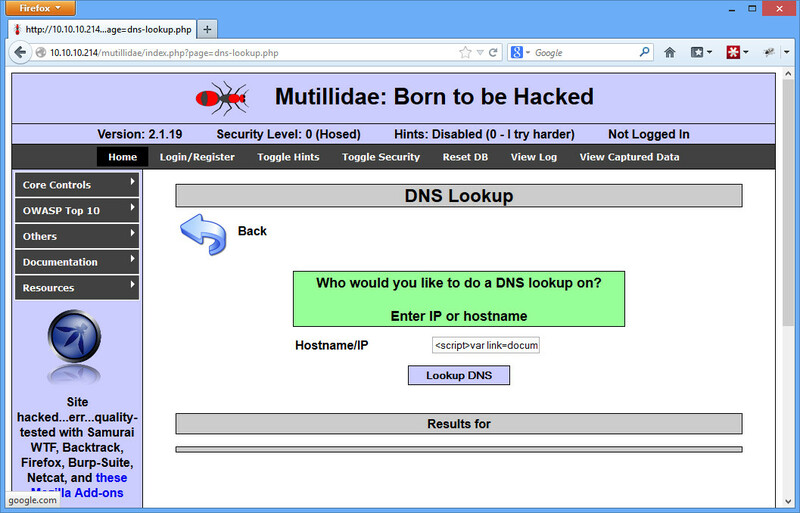 Try it on the Mutillidae page by adding that to the Hostname/IP page. First, we want to understand the difference between a reflective or non-persistent attack and a Persistent attack. The example above is a reflective or non-persistent attack. Basically whatever you enter in the textbox will be reflected on the next page. A persistent attack is when the user’s input gets entered into a database, and then later is reflected on some other page as information gets pulled out of a database. Mutillidae has an example where you can enter a blog posting. Then any other user can read that blog and be affected by whatever XSS attack was entered. This is often the more dangerous attack because it can affect more users. After clicking submit, check out the “Home” page button. It now goes to Google.com instead. Sure we’re just hacking ourselves right now. But try it on one of the persistent XSS URLs (such as the blog posting link). Now anybody that views your blog post has their Home link changed to google.com. Metasploit has a framework called XSSF that you can try to use. This entry was posted in practical hacking and tagged beef, cross site scripting, mutillidae, persistent xss, reflective xss, xss on February 14, 2013 by admin.